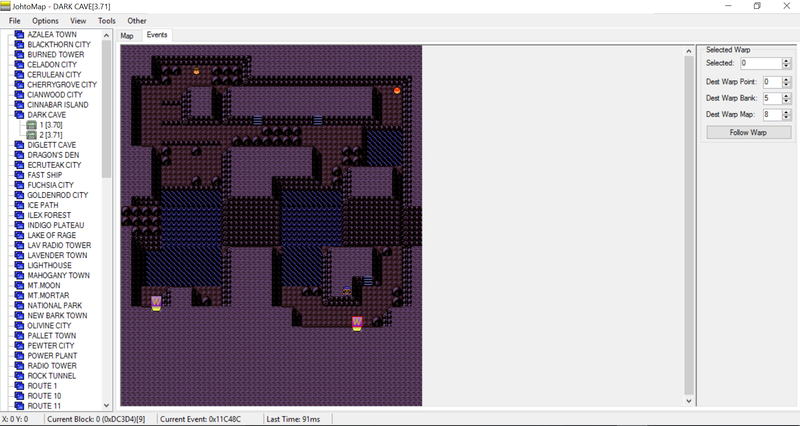 EDIT2: Ah, the broken warp is the one I highlighted (the one leading to route 45). There are two normal dirt blocks. Both look identical. One has warps enabled, the other doesn't. Just select the one that the working exit uses and put that one in front of the exit that isn't working. Thanks Mateo, I'd never figured out by myself - I did suppose it could had something to do with collision settings, but I focused my attention on the tile having the door instead of the one in front of it. Luckily, having read your collision guide, it was easy to figure out the ground tile with 0/0/0/70 was the one I needed :-) Thanks! I'd really say it's up to you if you want to release it or not. Really and truly, the forums here aren't as active with players in general as they once were, so most hack threads tend to be a bit slow in responses. For example, Red++ has like 2 pages in the thread here, but on PokéCommunity it has 65 pages and won Hack of the Year in the Sideshow Showcase section. So I wouldn't really gauge interest in a type of hack based on how many replies it gets here currently. If you want to show it off, I say post it. If you don't feel like it, you don't have to. And if you want more feedback on it, you might want to consider posting in a more consistently active forum, like the Sideshow Showcase at PokeCommunity, since it has a lot of "smaller" hacks ie hacks that aren't a whole new game but just change difficulty or Pokemon availability or add new features and whatnot.